I'll share some of his thoughts in a moment, but first I wanted to break-down the show and how it went for me! After 10AM struck on the clock everyone started making their way in to begin interacting with the guests and vendors. One big name there was George Pérez whose table stayed incredibly busy during the day. Other cool guests were Keith Champagne who drew a comic I loved titled, "The Mighty," and Tom Nguyen was there as well! Nguyen has of course done comic art for various publishers and has been a part of the reality T.V. show I often discuss, "Big Brother," helping with set design and artwork that appears on the show. It was really cool to discuss the show with him and I'm even more excited for the soon-to-launch season! Other creators whose work I was not as familiar with but who had some really cool stuff were there as well--and I picked-up some work that looked really cool by them! A gentleman by the name of Seth Ferranti who has written true-crime books based on his time in prison and who also writes for VICE has crime-comics he had made--one of which had artist Joe Willis who've I chatted with at other comic-conventions. I bought his book, "The Supreme Team," and am eager to read it. A writer named Jon Parish was there too promoting his comic, "Secrets and Shadows," as well as a new work, "ClusterF@#K." His enthusiasm for his works got me really interested and I picked up, "Secrets and Shadows," as it sounded quite cool--in a world where super-villains no longer exist one suddenly shows up and starts killing all the heroes till the son of a beloved hero who refused to take up the family business has to get involved--sounded like my kind of book! Other cool comics I picked-up included the 1st issue of the book, "Rigel Raine," by 3 Moons Studios, which discussed a futuristic world set in space full of violence and mayhem all centered around the titular, character, Rigel Raine. Yet another interesting book at the show was, "Ghost Town," which looked like quite the ominous horror story. Plus, I met a cool artist named, Jesse Kwe, and at another table I made the acquaintance of Justin, "Holmes," Holman, who had really solid work as well. A fun book by Dan Killeen! 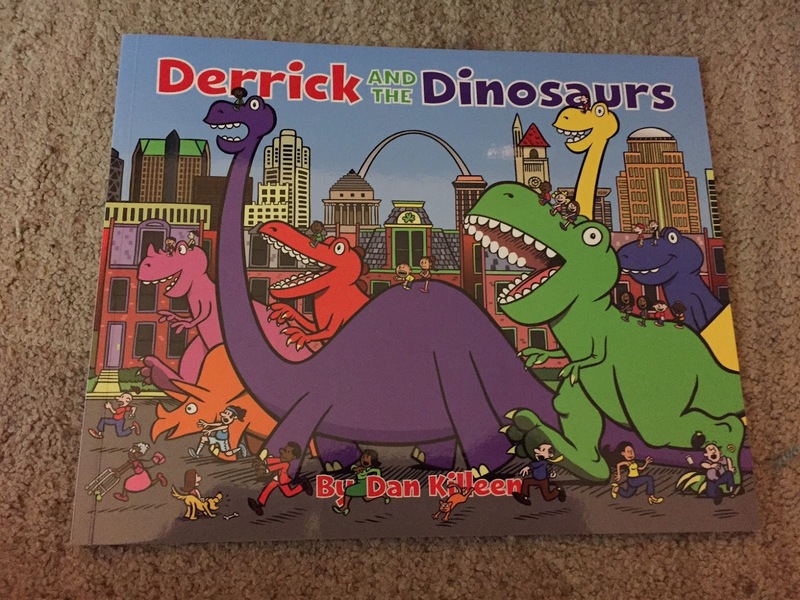 I met Dan Killeen at the convention and he had awesome children's' books set within Saint Louis. 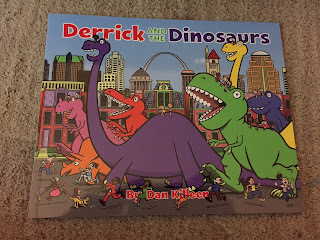 As a lover of dinosaurs I picked-up his title that features them, "Derrick and the Dinosaurs," which my cousin-in-law liked thanks to the title character sharing his name (minus an, "R.") We chatted about comics and his art influences and I really enjoyed meeting him. Speaking of cute artwork, a creator by the name of Greg Schmidt was at the show with his, "Schmidt N' Giggle Illustrations," which were charming fun--but also had a nice dark edge. I also ran into Aaron Walther, who I've seen at other shows and he continued to have cool stuff as always. It wasn't just comic-related artwork at the show however. "Circuits and Sewing Needles," were at the show with some astonishingly intricate and beautifully creepy pieces. "Rabbitts Den," was there too with some absolutely adorable pieces and I was quite taken with the handmade clothing by, "Crawling Chaos," who had delightful pieces for pets and human babies. My favorite design was on some pants that had a bio-hazard symbol. I would be remiss if I didn't mention some folk going by the name, "Thought Bubble," were at the convention with all kinds of helpful comic-storage items from your usual bags and boards to other neat ways to keep your comics safe (as well as comics for sale as well)! My fellow con-goer, Derick, told me he had a lot of fun. 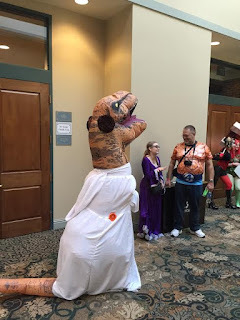 He enjoyed all the cosplay most of all, and he and I had a great time at the fashion shows where everyone showed off their efforts. Derick said the lines for things such as food or to interact with certain guests probably was his least favorite aspect. I asked Derick what he expected from the convention and he told me, "I expected all the cosplay and artists, and the show had that. As it was a smaller show they didn't have as many big DC or Marvel people I thought there might be, but there still was a lot of cool stuff." Derick said it was a good first convention and he looked forward to attending other ones in the future as he now had the con-bug (not a literal illness, just a desire to see more shows)! Yes, that is a T-Rex dressed a Princess Leia, and yes, it is incredible. Glad you had a great time! Wonderful blog. Hope to see you next year!